October 29, 1913 – The city’s Board of Supervising Engineers releases a report that predicts doom for the city unless something is done to solve its transportation problem. Representing the board, Blon J. Arnold proposes the construction of an extensive system of subways that would cost as much as $18,000,000. One tube should run under Clark Street from North Avenue to Twenty-Second Street. The second bore would be a “loop” entering the downtown section through a tunnel beneath the river at Washington Street, heading east to Michigan Avenue and heading west by way of a tunnel under the river at Van Buren Street. Three other subways are proposed as part of the plan, serving the north, south and west sides of the city. Arnold notes that the average speed of streetcars passing through the downtown district is about five miles an hour. He says, “This low schedule speed is caused by surface traffic congestion – car, vehicular, and pedestrian – and conditions are steadily becoming worse. This average schedule speed should be increased to equal or exceed the present average speed in outlying districts or free running territory, and the only method of securing this increased speed, as well as increased capacity is by the construction and operation of subways through the congested district.” The engineers’ report represents another example of how slowly the wheels of government can turn. The first subway in Chicago would not open for another 30 years. 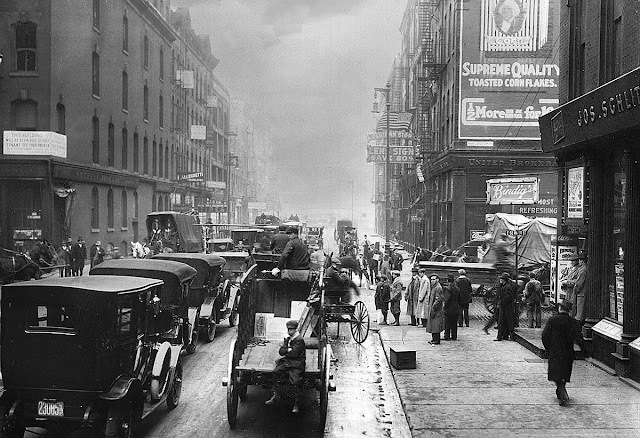 The photo above shows South Water Street in 1910. October 29, 1902 -- The members of the Drainage Board approve the issuance of $1,000,000 worth of bonds with the money from the sale to be used for the construction of bascule bridges and for the widening of the river. The bonds will be payable over a 20 year period and will pay four percent interest. Board members also approve the purchase of the plant and property of the Norton Milling Company at the Madison Street Bridge for $225,000. The property will be cleared and used to widen the river at this point. The original asking price is $400,000, but when the sanitary district threatens to acquire it by condemnation the offer is lowered by $175,000. With this move the city finally begins to deal with the problems that its antiquated center-pier bridges cause, problems that go back years but which gain special emphasis in January of 1901 when the city engineer refuses to take any further responsibility for nine fragile bridges. 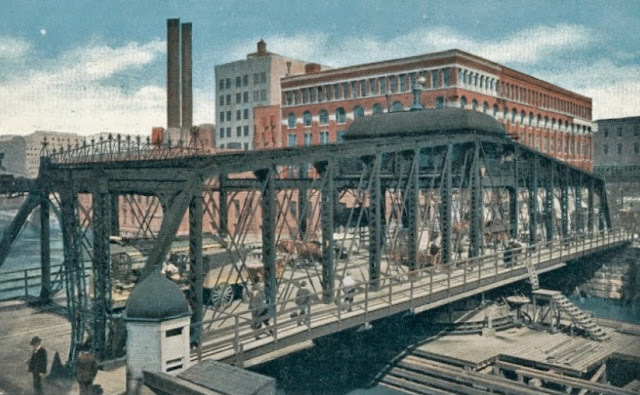 The swing bridge at Madison Street, completed in 1893, is pictured above. Note the narrowness of the draw on either side of the turntable. Imagine piloting a boat headed toward the bridge in a strong west wind, and you get some idea of how little margin for error there was in navigating the river in the days before the bascule bridges.